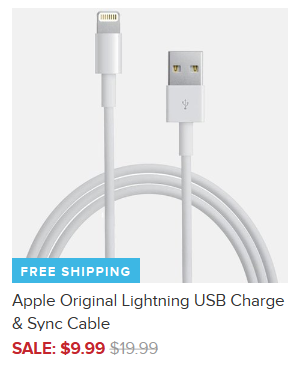 Apple Original Lightning USB Charge & Sync Cable $9.99 + FREE Shipping (Reg. $20)! You are here: Home / Great Deals / Apple Original Lightning USB Charge & Sync Cable $9.99 + FREE Shipping (Reg. $20)! Need a new charging cable for your Apple electronics? Then snag this Apple Original Lightning USB Charge & Sync Cable for ONLY $9.99 + FREE Shipping (Reg. $20) right now! This is a great price for a genuine Apple product!